Next week, I promise, I'll have a Bible character biography. Been quite busy with "life" and other writing stuff - and these are "premade," so much less work to put up here. And besides I've already read about the characters in this piece in my chronological Bible reading (about a week ago, if I recall!). It's a favorite story of many, I know (the Bible one - not my rendition of it, necessarily LOL). "Oh, how I love you, dear Mahlon." She caught the lump in her throat with a gulp, as tears misted from her brown eyes. "Whatever shall I do?" The delicate hand of Orpah touched her shoulder. She reached up and gave it a squeeze. "Now I understand, Orpah," Ruth whispered. "Now I understand." 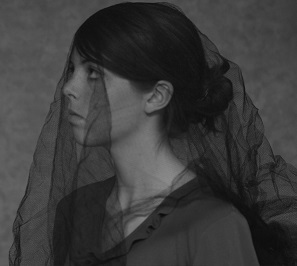 The two widows held each other tightly, until matronly arms engulfed them both. "Mother," the ladies said in unison. "Ruth. Orpah." Naomi sighed. "What a month this has been." Friends and family bowed their heads as the women left the burial site together. "Nothing. Nothing left in this land." Naomi kicked the dirt beneath her feet. "Barely enough grain for a loaf of bread." Ruth, grinding the wheat, shielded it from the dust particles. "We will make do, Mother. Your God will provide." Naomi sighed. "Perhaps. He has provided dear daughters-in-law to this old woman." "And to us, a wonderful mother," Orpah said, entering the home from the outside. "She has been so good to us. She has lost a husband and both sons. How can we deprive her of daughters as well?" Ruth sat in the corner beside Orpah, her voice barely above a whisper. "We are a burden on her, Ruth," Orpah retorted. "Two more mouths to feed and no man to help her with it. If we go back to our homes, we will be provided for. We may even get new husbands. We are still young, you know." Ruth held back her tears. "But what about Naomi?" Orpah smiled. "She is returning to her people. Perhaps they will take care of her, as our people take care of us." "Perhaps." Ruth shuddered. "Or perhaps not. Who knows what will meet her in Bethlehem? The least we can do is help her-go with her and aid her in her new start. Would she do less for us? Think of how supportive, how loving, she has been toward us--enemies of her people--for all these years. What an amazing God she must have to treat us that way. Do you really want to go back to our old way of life, our old gods?" Orpah rested her chin on her hand and sighed. "I suppose you're right. She would certainly appreciate the help." Ruth rose from the ground and grabbed a bulging satchel leaning against the wall. "Then we need to make haste, so we can catch up with her before it is too late." Once the girls caught up with Naomi, the three strolled together in silence. After a few minutes, they reached a divide in the road. Naomi stopped and looked both Ruth and Orpah in the eye. The stiff body before her did not answer. She continued staring as it was lowered into the ground. "Go back, each of you, to your mother's home. May the Lord show kindness to you, as you have shown to your dead and me. May the Lord grant that each of you will find rest in the home of another husband. *" Naomi embraced and kissed both of them, and they wept together. Ruth looked up at her mother-in-law. "We will go back with you to your people. *"
Naomi dismissed the idea as nonsense. Orpah leaned into Ruth and whispered, "She has a good point, and we would be a burden." Backing away, Orpah kissed Naomi on the cheek. 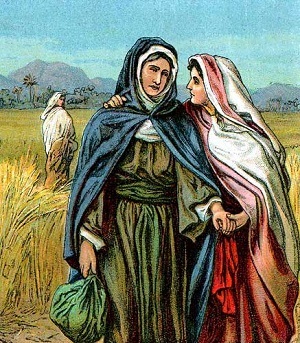 Wiping away tears, she left Ruth and Naomi, trudging back toward Moab. Ruth, however, clung to Naomi, swearing to follow her wherever she would go, and claiming Naomi's God as her own. I will help her through this struggle. And, God willing, she will help me through mine. Naomi put out her arms eagerly, receiving the wiggly, giggly bundle and pulling him close to her heart. "Little Obed," Naomi cooed, "What a wonderful family you have been born into." Ruth and Boaz looked down at their child with glowing, love-filled eyes. "Thank you, Mother, for loving me, for supporting me, and for encouraging me in my grief to reach out to this wonderful man." Ruth's eyes left her child's and rested on her husband, then her mother-in-law. "You have helped me discover the beauty from my sorrow." Naomi handed Obed back to Ruth. "It is you I should thank, sweet Ruth. You have given me help and hope. And, perhaps best of all," Naomi ran her hand through Obed's hair, "you have given me a son." This story's empty spaces can be filled in by reading the Old Testament book of Ruth, Chapters 2-4. How had God turned YOUR sorrow to joy?